Are you homeschooling in NSW (New South Wales), Australia? Many people are finding the whole homeschool registration process a stressful event. My advice - don't stress - just be as prepared as you can by knowing what you're doing and expressing it in your words. This page outlines how you may choose to write a program of study in each of the key learning areas. To prepare your program of study for your family's homeschooling life, I would firstly encourage you to set personal family goals. Once you have considered your goals, you should be able to continue and complete the outline of this program of study which will become an important statement for your family as to where you are headed, what goals you set out to achieve, materials you may use and the methodology you will choose to complete your goals. You do not need to have one of these programs for each child. Most of the details that you complete can be generic for the whole family. When you add, "Resources", you may differentiate between what each child will sue, if this makes sense in the way you are homeschooling. NOTE: This document is not an official or prescribed program for registration in NSW. This is a suggestion only. It needs to be modified to suit your family; You do not need to include everything listed here. Since many families have found this outline to be helpful in their homeschool planning, I have decided to explain it in more detail and provide links to the downloadable documents for those wishing to register for homeschooling in New South Wales, Australia. May be used by others and modified to suit. To help you create this homeschooling program, I have created a number of Word Documents that you can edit in order to make your own program. I have personally met with the Board of Studies and showed this document explaining that I hope others may find it useful as a guide to prepare their own plan. They expressed that they were happy for others to use this as a guide. The simplest and my preferable document is one which uses the Objectives from the NSW Board of Studies Syllabus. The Objectives are broader and more general. This document entitled, "Writing your own Program of Study - NSW.docx" can be used for all children, across all the ages. I would encourage you to use this. Are we strangling our own freedom by being too specific? The more specific we become in our programs - trying to match our teaching to each outcome statement, the less freedom we will enjoy. Keep things broad and general and we can get on with teaching ... and as we write what we are planning to do, we will find that our educational plans easily equate a quality education. It actually disturbs me to see Australian home educators so concerned about linking to the outcomes as well as to the content. Our focus must remain on education - and to do so, we need to continue to teach in freedom, educate to our children's interests and to our family's goals and you will find - that the education they receive will have no trouble meeting NSW Objectives. I have also created Word Documents for those who wish to use the Stage Statements. 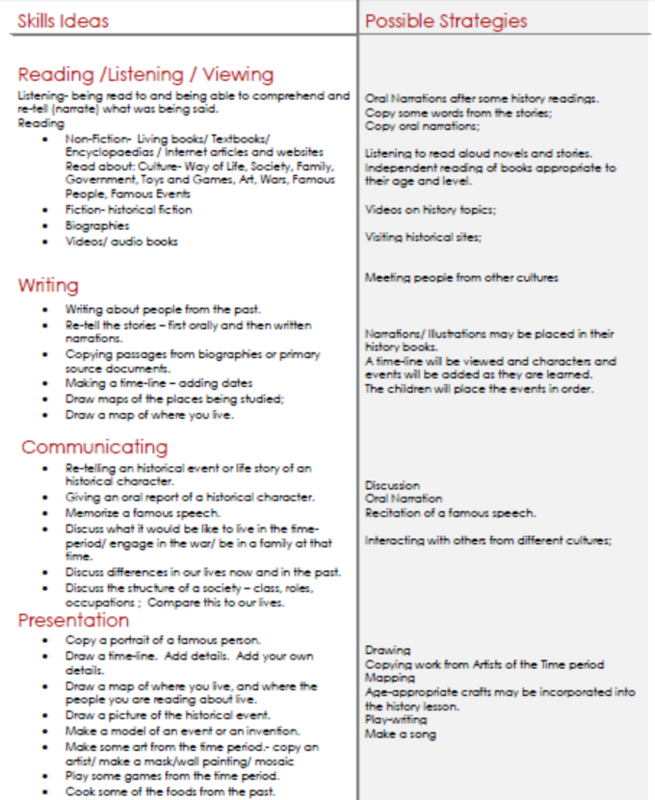 I have created these documents for Stages 1 - 5 across the 6 Key Learning Areas. If you choose to use these programs - you will need to be more specific and write different programs for different children. Stage Statements are statements written for each stage and each key learning area. My first preference is to use the Program written to the Objectives and then secondly, the Stage Statements as they are still broader than the outcomes. You will find all of the Word Documents in a .zip file. There are six documents in the zipped file. Open it and then "Extract All". Download here: Documents to help write a program in NSW. How do I prepare a Program of Study for Registration in NSW? My suggestions here are very similar to what I say on the homeschool planning page, however, on this current page, I will be addressing how to write a program according to the six Key Learning Areas as defined by the NSW Board of Studies - for homeschool registration in NSW. Create this document first and foremost for your family! I would like to urge you to create this document first and foremost for your family. This is your working document of what you plan to do - Don't prepare it for the governing authorities - prepare it for your family! Most of the components in the program of study will not need to be updated or changed - except for the specific resources you will be using over the years. If your methodology or goals change, you can add, delete and change accordingly. For the purpose of registration, you may like to use the format and display it as described in the downloadable document. This is only a suggestion. Please modify it to suit yourself. I have used this format so that individual families can show that home education is different for each family and so the reasons, methods, resources and experiences will be different. I hope that you find that it is a flexible document which helps you think through home education and allows you to express it in your own way. Here is a suggestion on how to display your program. Firstly, add your Philosophy of Education. Your "Philosophy of Education" may sound somewhat daunting - but really it means how you view education. I would recommend that you consider writing out your own philosophy and then deciding whether or not to include it officially in your program. It will be a worthwhile exercise for you to really think through your reasons and methods and you may find it a source of encouragement for yourself, when struggles come. The next part of your program explains how you will address the six Key Learning Areas. If you are homeschooling somewhere other than NSW, you will still find that the document could be tweaked for you. The six Key Learning Areas for primary education are English (language arts), Human Society and Its Environment (History), Science, Mathematics, Personal Development Health Physical Education (PDHPE) and Creative Arts. For secondary education - the educational program must be based on six of the eight BOS KLA's. The program must include English, Math, Science and HSIE plus courses in another two of the Board's KLA's. Each Key Learning Area is divided into explanatory paragraphs which you need to edit for your family. You may choose to add this Skills and Strategies Appendix to your program or you can just print it out and use it for reference. It is organized under the Key Learning Areas and it suggests a bunch of ideas - ideas to present the learning, or experiences your child can be involved in. On my page about simplifying homeschooling, I speak about considering the big picture of education and that in reality, there are certain skills that we would like our children to learn. 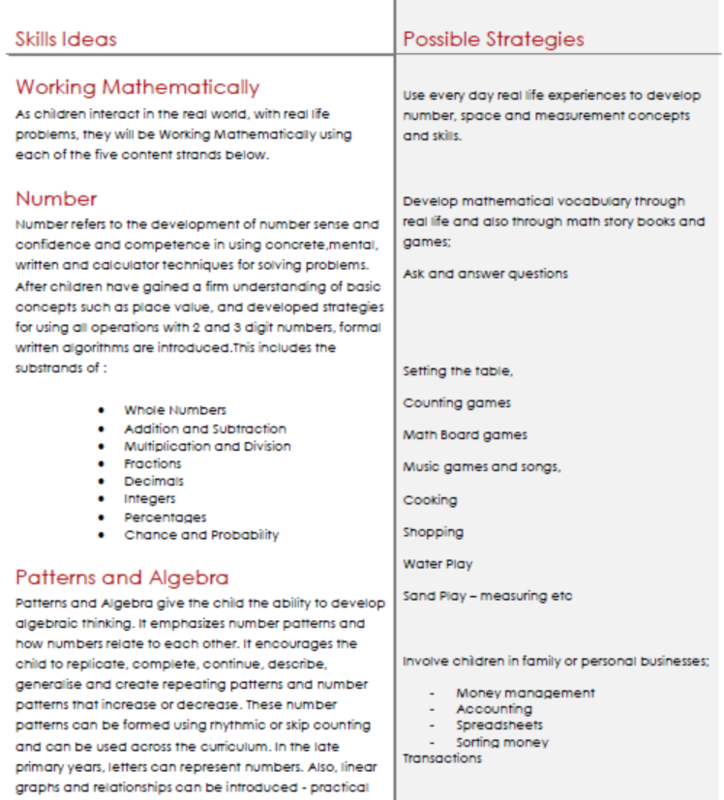 To help you gain an understanding of what I mean, I have written a 24 page Skills and Strategies Document showing the range of skills and strategies and how your children can learn these skills across the subject areas over many years. Keep reading about how to focus on skill development as a way to simplify homeschooling. Has this page been helpful to you? Leave me a note below or give me a suggestion through my contact form as to how I can improve the program of study for those registering for home education in NSW.